Since 2014 ISIS has seized control of large areas of Iraq, including several major cities. Millions of people have fled their homes, and there’s still an urgent need for humanitarian assistance. 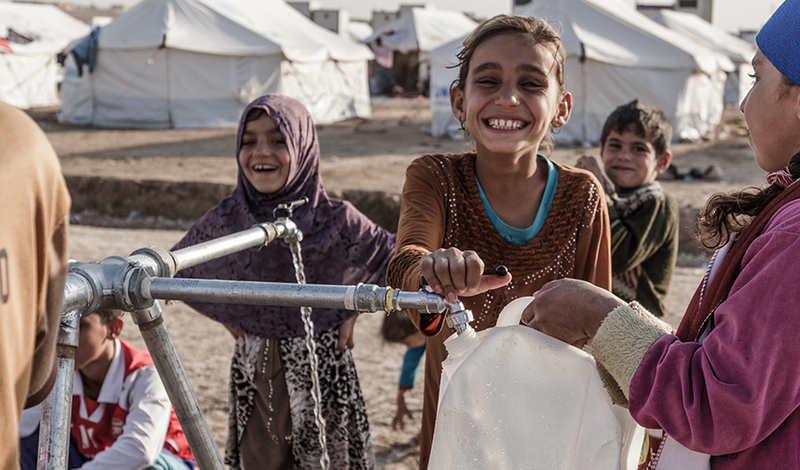 Oxfam is working in Iraq to support people caught up in the conflict by providing emergency services and longer- term interventions in the areas of water, sanitation and hygiene and food, in coordination with local authorities and partners. Through our advocacy expertise, we’re influencing humanitarian assistance in Iraq so we can protect the rights of all individuals affected by conflict. We’re providing life-saving aid to those who need it most. Our staff on the ground are providing safe drinking water and emergency food, as well as cash or vouchers. We’re also rehabilitating the entire water infrastructure, supporting hygiene promotion and offering livelihood opportunities for displaced families and those returning to their villages. In July 2017, the city of Mosul was retaken by the Iraqi security forces. Now the city’s residents are starting to return home. Of the 900,000 people that fled, more than 200,000 of them have already gone back to rebuild their lives. However, these families continue to face severe risks from revenge attacks and explosives. They’re also faced with a lack of clean water, healthcare and other basic services. Men, women and children returning to Mosul must be supported with adequate information, guarantees of security, aid from humanitarian agencies and access to social services. Since the campaign to retake Mosul began, Oxfam has assisted more than 300,000 people affected by the conflict.